The Bulls and Wizards played just three times this season with the Wizards winning two. Both of those wins were in January, shortly after the Bulls traded Luol Deng. Though the Bulls were playing well in that stretch with seven wins in nine games, both losses were to Washington, which had Nene playing at the time. Nene suffered a knee injury after those two games. He returned late in the season, but after the Bulls won in Washington April 5. Here’s a look at the three games between the teams this season. The Wizards led all the way after an 8-0 start with Nene and John Wall each scoring 19. The Bulls were down 15 in the first half, closed to four in the third quarter but then gave up a pair of threes and Nene closed it out with a strong fourth quarter as the Bulls had trouble containing Nene’s post stretch. They did take advantage of Nene’s general unwillingness to chase out on shooters. The Bulls and Wizards played just three times this season with the Wizards winning two. The Wizards against got off fast, though the Bulls matched their scoring early and trailed 30-27 after one quarter. But it was the next game after the triple overtime win in Orlando two nights earlier, the second triple overtime game of the season. The Wizards were in that odd stretch trying to finally get above. 500 for the first time in John Wall’s career and had fallen back. The win got them to 19-19 while the Bulls fell to 18-20. It was more pause as the Bulls would go on to have the best record in the Eastern Conference from January 1. Wall had 23 points and 11 assists and made one of the highlight plays of the season, a fast break layup after a steal in which he made the shot throwing the ball over his shoulder with his back to the basket. But it was a turning point sort of game for the Bulls and the rotation of coach Tom Thibodeau. Tony Snell had some success in the earlier game against Washington’s taller wing and perimeter players. So although Augustin had 16 points in 19 minutes and four of six on threes, Thibodeau sat him down the stretch and the Bulls offense would slow to a near stop. It pretty much would be the end of that experiment and thinking as Augustin would soon move in as a fourth quarter regular down the stretch. It probably took losing that game to get to the team’s most successful fourth quarter lineup. The Bulls had led 70-62 in the third quarter while Trevor Booker and Martell Webster were hitting shots for Washington. 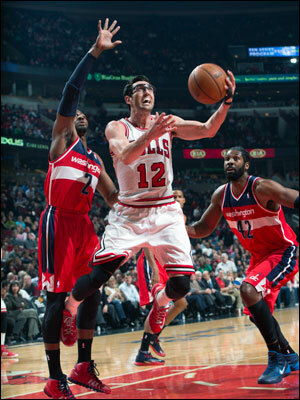 Kirk Hinrich led the Bulls with 18 points. The Wizards scored 10 straight at that point highlighted by the Wall play and the Bulls stalled down the stretch with just one basket in the last 5:17, missing eight of their last nine shots with no Augustin and Snell in and out down the stretch. But the Bulls had a chance to tie trailing 96-93 with about 10 seconds left. A play for Mike Dunleavy was disrupted. Jimmy Butler, who had played 60 minutes in the Orlando game, got the ball, got stuck and had his shot blocked to end the game. It was a dominating performance from the Bulls in a game both teams were peeking ahead for perhaps a playoff matchup. The Bulls did in holding the Wizards to 26 first half points in running up a 28-point lead. Getting Augustin into the rotation full time and down the stretch continued to produce dividends as Augustin led the Bulls with 25 points and was six of 11 on threes. The Wizards are not noted for their defense in the backcourt, though previously Bulls coach Tom Thibodeau had been concerned about Augustin’s defense against the Wizards’ high scoring guards of John Wall and Bradley Beal. But Thibodeau stuck with Augustin’s offense and he was backed up by a strong defensive game from the Bulls big men. It’s a formula the Bulls will use in the first round series against Washington, though Nene did not play in this game. Joakim Noah had 21 points and 12 rebounds as the Bulls won their fifth straight to move into a third place tie with Toronto. The Wizards made a brief run to get within 11 with 35 points in the third quarter, but a Noah three-point play started a 12-0 Bulls run to put the game away.